No two estates are created the same. We help you choose the estate dispersal method for you and your family. On-site Live Auction/Simulcast Auction – our preferred estate dispersal methods. Live Auction is one of our preferred estate dispersal methods. Using the LIVE auction estate dispersal methods to settle an estate is our preferred method. Live auctions are tried and true and can offer benefits over other methods. The LIVE component is accepted statewide and offers a main stream advertising outlet. Items of lesser value and be grouped and sold with other items on the spot. The live method can be adjusted ‘on-the-fly’ to account for changing conditions and offer a more complete solution. Items are paid for and removed generally the day of the auction, expediting the settlement process. A simulcast component can be added to the live auction. This incorporates ‘internet bidding’ into the live auction to offer items to a broader audience if needed. Absentee bids can also be accepted to accommodate bidders who may not be able to attend. Online only or timed bidding auctions can be a useful way to sell your items at auction. Online only auctions are marketed using the same method as live auctions. On-line only auctions offer the following benefits. Set-up is not as dependent on planning for weather. While many items are left in the same place and sold via photo, there is more to do in the description department. Bidders are not all at the property at once. Many times an item preview day is held, generally the day before the auction. But it is a larger window and the crowd is minimal. This aids greatly in an auction situation where room or parking may be an issue. Consignment auction – we combine your items with other individuals. 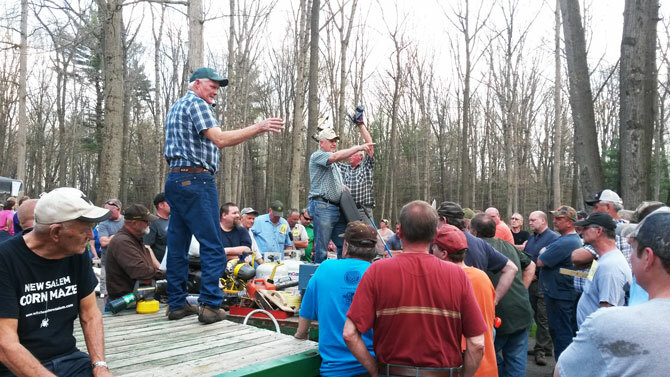 Multiple times a year we conduct an auction of several smaller estates in one location. While shipping is an added cost, this offers an auction alternative for many customers. A scheduled sale of the items over a multiple day period. Items are tagged with prices and the prices lowered as the sale progresses. See our facebook page for an ongoing listing and photos or our estate dispersal methods. In many cases an auction is the most effective way to disperse of the contents of an estate. By aggressively marketing the assets of your estate we can maximize your overall return. Why sell my items at auction? For many years families and executors have been using auctioneers and the auction method to disperse personal property. By bringing all assets to auction, value is achieved by selling and marketing items in their entirety. Is my estate a good candidate for an auction? Let us help you make that determination. We will examine your merchandise and offer a solution that fits your needs. Contact us for a free consultation. How much time does the auction process take? A typical auction takes 4-6 weeks to properly advertise and set-up. The typical auction process follows this timeline. Agreement of terms and signing of the contract. Discovery, cataloging and photographing of items. The amount of items is overwhelming! How will you get it ready in time? It is what we do! Our staff is very experienced in the auction set-up process. We also have equipment and methods to aid us in the set-up process. What about my Real Estate? We are very successful at selling Real Estate at auction. If advertised with the personal property the real estate and contents benefit mutually from advertising. See our Real estate auctions page.